My only Wormwood reference in extreme metal used to be the 2009 album by Marduk. Even though the band Wormwood is undeniably Swedish its music is far from the blackened craft of Marduk. Instead, Wormwood take their inspiration from the more melodic spectra of the Swedish black metal scene. Early Naglfar and newcomers Ages, in particular, spring to mind. What sets Wormwood apart from the aforementioned acts, though, are the different influences that are so well-integrated into the black metal core. Distinct folk music sections (as in 'Tidh ok ödhe'), upright rock'n'roll guitars (particularly the mid-solo in 'Godless Serenade') and beautiful clean female vocals helps bring a healthy dose of variation to the music. Admittedly, neither of these features are particular favorites of mine in metal music, but Wormwood makes them work astonishingly well. The result is an enjoyable mixture of darkness, beauty, melody, and aggression. The main issue to be found is the running time which feels about 15 minutes to long for the listener to keep an undivided focus, rather than the actual musical components. Melodic black metal bands often balance on the edge of a knife when it comes to maintaining the dark essence of black metal amongst the melodic riffs and the verse-bridge-chorus song structures. Wormwood strays along that edge gallantly, despite the diverse influences and the fact that most tunes on 'Ghostlands' are extremely catchy. Almost to the point where most black metal fans would raise a considerable amount of eyebrows. 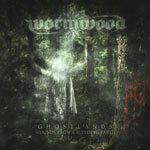 With 'Ghostlands', Wormwood has set themselves apart in a genre filled with conventions by incorporating several unorthodox influences into well-written and catchy music. Wormwood did release an EP two years, yet the maturity and focus in the songwriting surprises me coming from such a fresh act. This is a mandatory listen for every black metal fan who does not shun from mid-90s Swedish melodies and a well-balanced dose of unconventional influences.